Have you ever given your kids a homeopathic medicine? Have you ever bought and used any of these types of homeopathic medicines? If so, did you know they were homeopathic or what it means that they are homeopathic? Steven Novella provides a nice explanation of homeopathic medicines, which he describes as "nothing but placebos, magic potions based on prescientific notions and with “active ingredients” that are often diluted beyond the point where any original substance is likely to remain. Homeopathic products are therefore literally nothing. Further, clinical trials have consistently shown that they do not, in fact, work." The National Center for Complementary and Alternative Medicine defines homeopathy as "an alternative medical system that was developed in Germany more than 200 years ago." Like cures like — also called the law of similars, it proposes that substances that cause similar symptoms can help to heal people. For example, homeopaths have suggested that rattlesnake venom can cure Ebola infections because they both involve bleeding. The homeopathic treatment for insomnia is coffee. Law of the minimum dose — also called the law of infinitesimals, it proposes that medications are most effective when given at the lowest possible dose, which leads to 'enormous dilutions' of most homeopathic medicines. For example, the Belladonna in Hyland's Teething Tablets has been diluted 1,000,000,000,000 times. Although there may not be any of the original ingredients left when you extremely dilute them, as is done in many homeopathic medicines, homeopathic practitioners claim that they still work because a 'spirit-like essence' or 'memory' of the ingredient remains in the diluted "medicine." How dilute do some of these homeopathic medicines get? Boiron Oscillococcinum for Flu-like Symptoms is diluted so much, at 400X or 200C, that to make sure that you got at least one molecule of the active ingredient, you would have to take more pills than there are atoms in the universe. It is also interesting to note that skeptics claim that there is not enough water on Earth to make such a dilution. Would you try to make your child hotter if he had a fever? Would you give him one single drop of acetaminophen or ibuprofen (or to be more in line with homeopathic practices, dilute the drop of acetaminophen in a gallon of water, then put a drop of that mixture in a bathtub of water, and then give your child a drop, after first mixing a drop of the bathtub water in an Olympic size swimming pool full of water), because you think that would work better than his recommended dose of one teaspoon? If not, then why would you give your child a homeopathic medicine? Unfortunately, many parents do give their kids homeopathic medicines. They don't know what homeopathic medicines really are, which is not surprising when pharmacies like CVS and Walgreens mix them together on the shelf with other traditional over-the-counter medicines for fever, allergies, coughs, and colds. Some parents confuse homeopathic medicines with herbal medicines and other over-the-counter natural remedies. They use them for symptoms and conditions for which there are no or few pharmacological alternatives, like teething pain, gas pain, colic, and cold symptoms in young children. There is no evidence that these medicines work, though. There is also often no good reason that you have to run to the pharmacy every time your child has a new symptom, whether he is teething, has gas, or a cough. Talk to your pediatrician about alternative treatments that might provide your child with relief to these very common issues. How do you avoid homeopathic medicines? 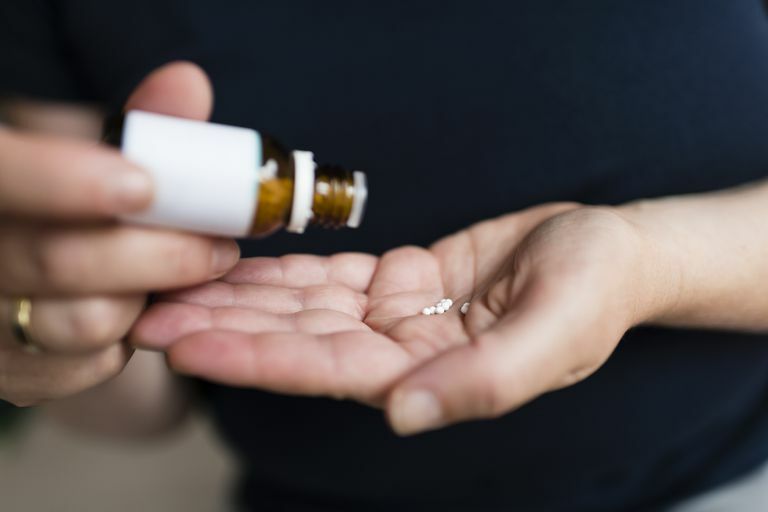 You could just try to avoid certain brands, like Hyland's, but now that Walgreens and other stores are selling their own versions of homeopathic medicines, you might still be fooled. These products should also state that they are 'homeopathic medicine' on the label, which can help you identify and avoid them. The only sure way to tell is by looking at the ingredients list, though. Look for things like '6X HPUS' or '200C HPUS.' Those are the dilutions as described in the Homeopathic Pharmacopeia of the United States. If a product has a dilution factor and mentions HPUS, you can be sure it is a homeopathic medicine and has been repeatedly diluted. Homeopathic medicines are not regulated by the FDA for safety or efficacy. The bottom line is that homeopathic medicines are no better than a placebo. And since parents may choose homeopathic medicine over conventional treatments, there is certainly harm in choosing to use homeopathy. National Center for Complementary and Alternative Medicine. Homeopathy: An Introduction. QuackWatch. Homeopathy: The Ultimate Fake.